We went out to the beach this morning, and found it too breezy again. We sat down for a while, anyway, and took a few photos. We spent two sessions at the pool, with a lunch in the apartment in between, and throughout the afternoon the clouds moved in and blotted out the sun. Dinner was at Tapas, which is both the name of the place and the style of dining. Tapas dining features entrees cut down to the approximate size of an appetizer, allowing you to sample more than one entrée without stuffing yourself. These folks know how to do a wine list, and they also have what’s on the list in stock. They also realize that you don’t store red wines on the beach. We decided to order one thing that each of us wanted, and one thing that we both agreed on, plus a small salad. Diane won the salad round, even though my Spring Mix Salad with blue cheese, spiced pecans and fresh pears in orange vinaigrette was pretty good. Her Raspberry Spring Salad with fresh greens topped with candied almonds, feta, cranraisins and fresh raspberry vinaigrette was better. She also won round one of the entrees, with Sourmash Chicken, a chicken breast with country ham, bourbon, caramelized onions and cream was succulent, while my Tornado Vernoff, which was a grilled filet mignon with caramelized garlic, deglazed with brandy and Madeira wine, then blended with demi-glace was pretty tasty, but took a distant second place. However, I prevailed on the second entrée with the Grand Marnier Duck, which was a duck breast with pears and grapes napped with a grand Marnier sauce. Her Pork Apple Jack, a pecan encrusted tenderloin sautéed with apples, brandy and demi-glace was also tasty. All in all, a very good dinner, and a nice recovery from Tuesday night’s less-than-spectacular effort. Then, it was off to the Old Oyster Factory to see whatever sunset could break through the seriously overcast sky. 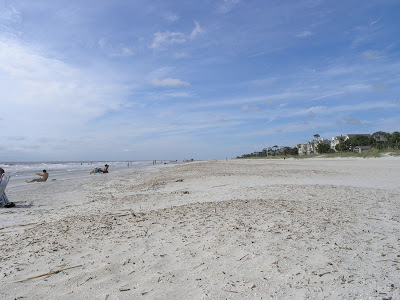 Hilton Head Island has the mainland on the northwest side, separated by Calibogue Sound, a narrow, curvy stretch of a waterway, and the Atlantic on the southeast side. In the middle is a very large marshland that nearly cuts completely through the island. 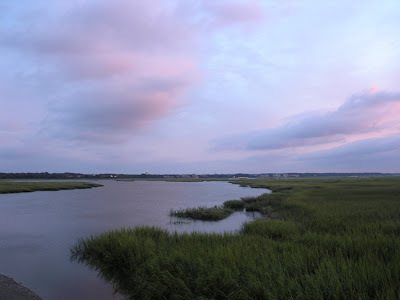 On the marsh is where the Old Oyster Factory is located, and it is a very picturesque location. Along with a Bailey’s and coffee, we enjoyed the sunset, which managed against heavy odds to be right pretty. After a stop by the Fresh Market to pick up some stuff for breakfast, it was back to the apartment for some M.A.S.H. episodes and a little email and Internet catch-up. Tomorrow there’s a 70 percent chance of rain. We’ll hope the 30 percent prevails.